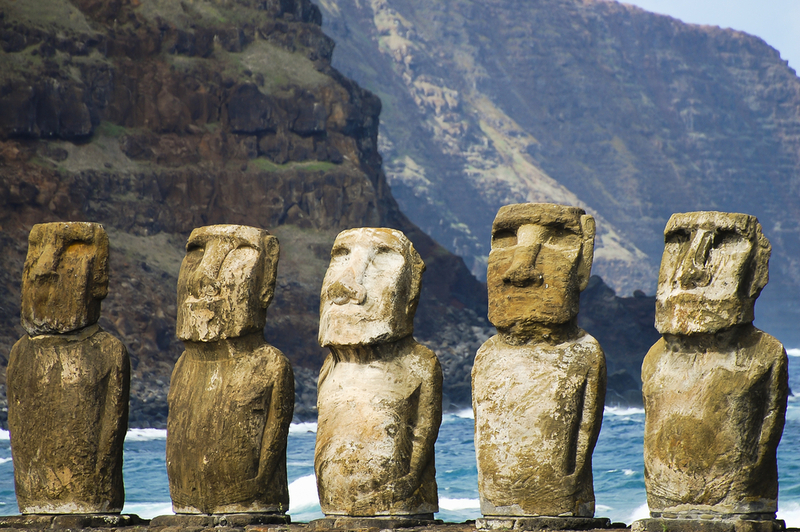 From Hanga Roa you can visit Tahai, a ceremonial center showing vestiges of the period when Easter Island culture was at its height. The first group of moai is at the temple of Aha Vai Uri. Opposite the temple is the ground used for ceremonial and religious ceremonies. Further north stands a solitary moai, Ke Te Riku. Following the road which leads to Anakena, you reach Ahu Akivi: this is a restored ahu containing seven moai, with decorations on the platform. You can also visit the Te Pahu cave, one of the biggest on the island. Leaving Hanga Roa by Avenida Atamu Tekena you will reach Vinapu, where you will find two ruined temples. Two kilometers further on you will find Hanga Poukura, another fallen archaeological monument. Rano Raraku is one of the most frequently visited sites on the island, since almost all the existing moai were carved here. If you follow the path you will find 397 unfinished moai. Continuing along the north coast you come to Anakena, the most beautiful beach on the island. It has white sands and there are two restored ahu.